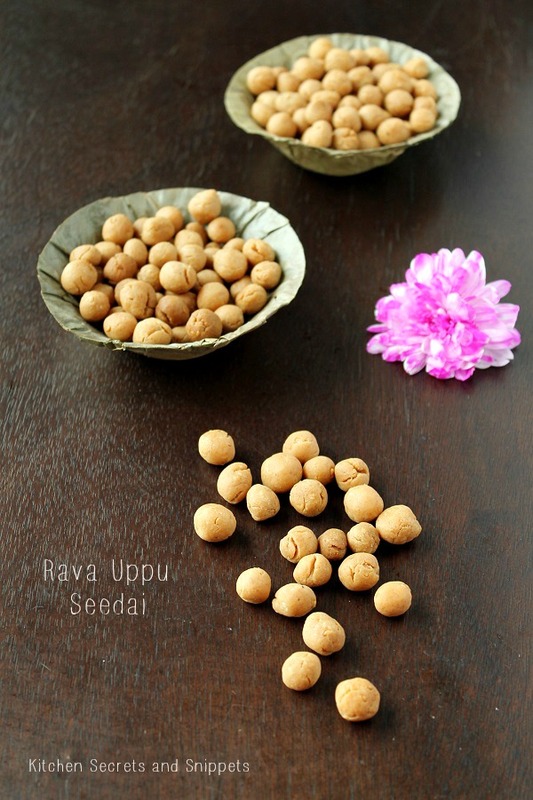 Kitchen Secrets and Snippets: Rava Uppu Seedai for Janmashtami..
Rava Uppu Seedai for Janmashtami.. Happy Janmashtami to all, Check out what I've made for this year to celebrate Lor Krishna's Birthday.. Have a great time munching all those yummy goodies..
Dry roast the semolina on a medium low heat until it is roasted to a light golden in colour. Transfer the semolina to a wide (dry) plate and let it cool for some time. In the same pan, dry roast the rice flour as well for 3 to 4 minutes and let them cool. Dry roast the shredded coconut to light brown as well. Grind the semolina , if that is coarse, for some time ( skip the grinding if the semolina is fine already) and sieve it thoroughly. Powder the roasted coconut and set aside. Also sieve the rice flour as well. Transfer the coconut powder, rice flour and the semolina to the wid bowl and add the butter. Mix the butter throughly with the flour so as the mixture should resemble like crumbled. Later add in the salt, sesame seeds, omam to the flour and mix well. Now add water little by little and make the dough in a way that it should crumble when the dough is pressed but it should hold the shape when u make balls. Do not add too much water. Cover the pan and let the dough rest for minimum 30 minutes. Later, pinch the dough little by little and form small balls , it need not be perfect in shape. Place on a newspaper or on a kitchen tissue( so that it absorbs the moisture) for 30 minutes or place it under the fan. Mean while, heat the oil over the medium flame and slowly fry the seedai in batches on medium heat for 3 to 4 minutes until the seedai turns golden in colour( as the cooking process will further takes place even after drying, so better drain them when turn golden in colour). Drain the seedai to the kitchen tissue and let it cool down to room temperature. 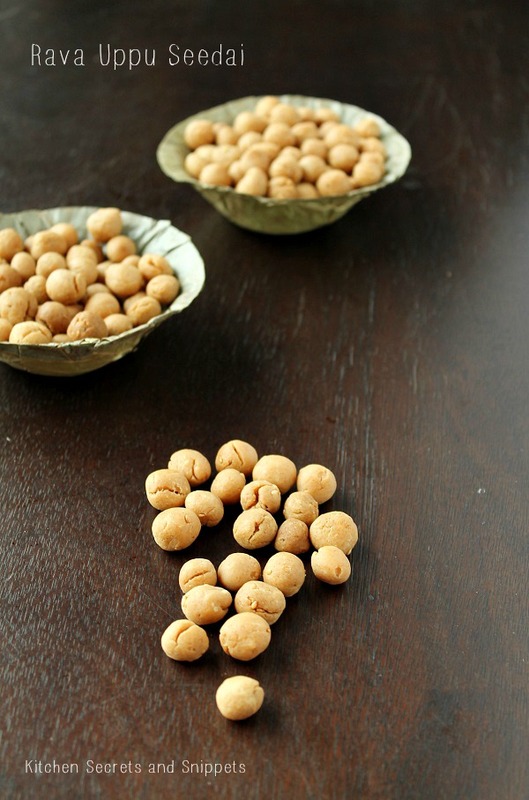 Store them in an air-tight container and relish. Grind the semolina , if that is coarse, for some time ( skip the grinding if the semolina is fine already) and sieve it thoroughly. Powder the roasted coconut and set aside. Also sieve the rice flour as well. Transfer the coconut powder, rice flour and the semolina to the wide bowl and add the butter. Mix the butter thoroughly with the flour so as the mixture should resemble like crumbled. perfect and delicious crispy uppu cheedais. wow cute seedai looks super crunchy :) wud love to munch them any time !! Seedais look so delicious and mouthwatering. Wonderful preparation. 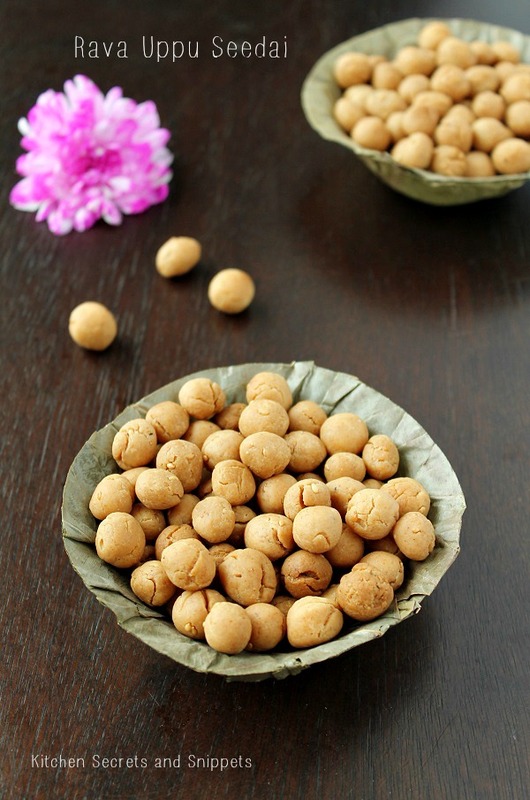 Happy krishnajeyanthi de.seedai looks so interesting. 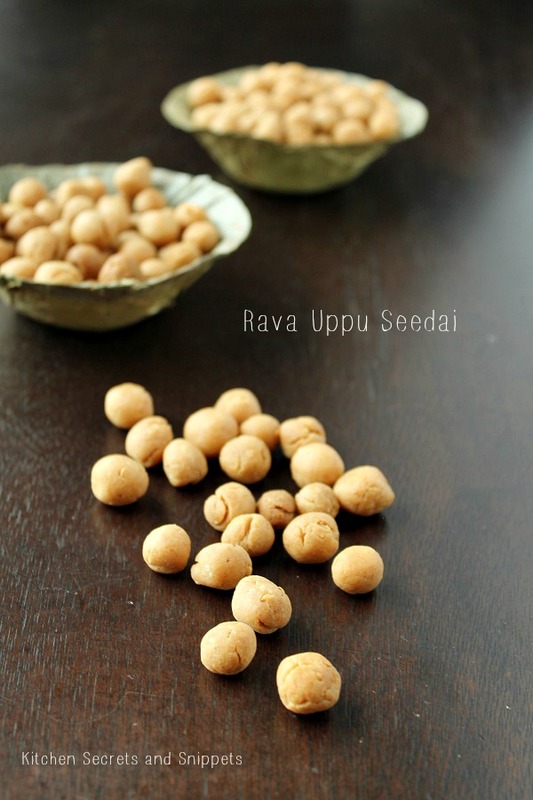 Super crunchy and quite addictive rava uppu seedai,love munching some.